INDIA IS A shopper’s paradise. In fact, one of my favourite pastimes is shopping in India. You just can’t beat the combination India offers: an incredible variety of gorgeous items, often hand-made, at temptingly low prices. Here’s my list of what buy in India whether in person or online. You can buy Indian clothes online and just about everything else, or visit Indian clothing stores in person. 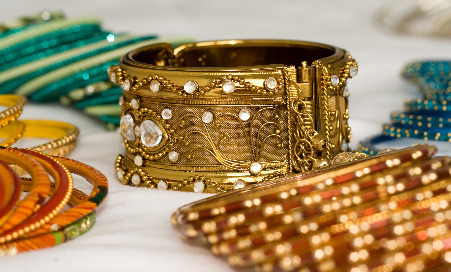 Buying jewelry in India is one of the most fun things you can do, from cheap bangles to precious gems. 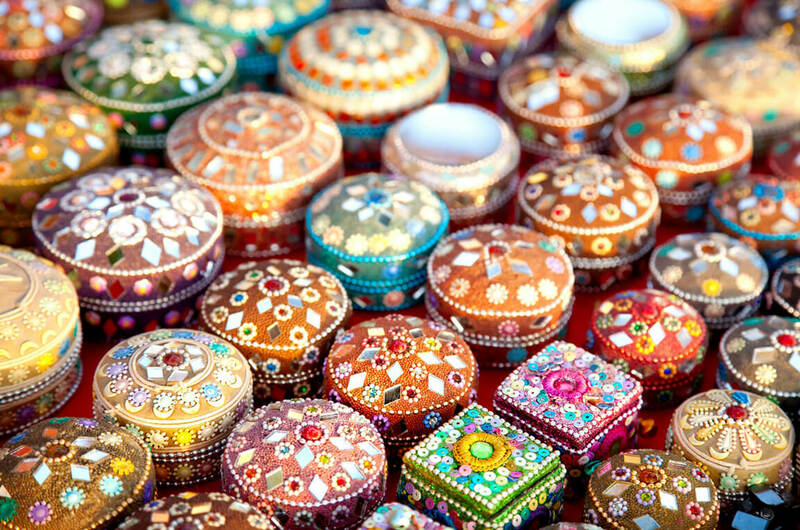 Jaipur is the gem capital of India, but you can find jewelry virtually everywhere. 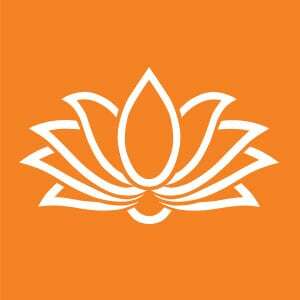 For more information on buying Indian clothes and more online, check out this post. 1. 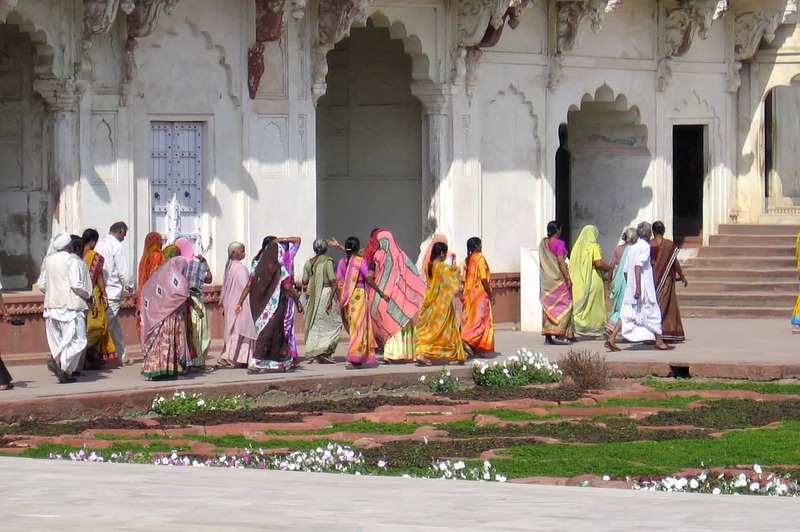 Indian clothes, dresses, textiles. India is famous for cotton and silk clothing, bed covers, table cloths and wall hangings. Many of these come adorned with hand beading and/or hand embroidery and will make you feel like a princess. And you can buy a lot of great Indian clothes online too. 2. Shoes fabulous shoes. 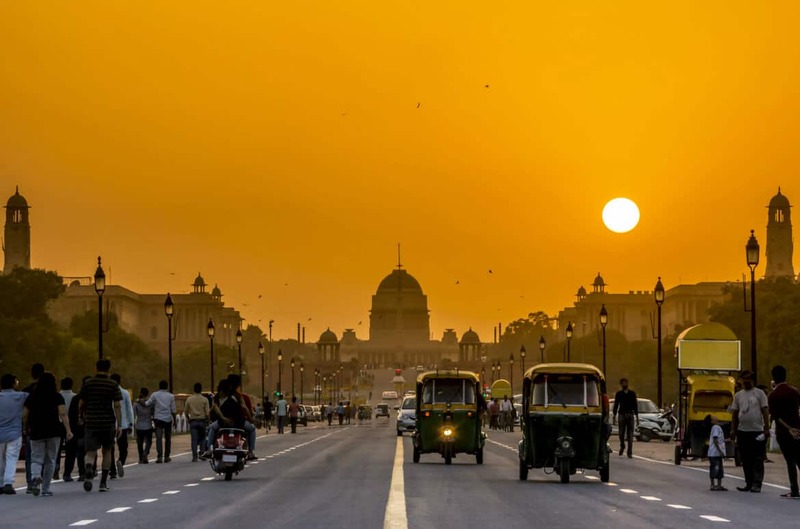 From inexpensive leather juttis (traditional embroidered slippers) to crystal-beaded, high-heeled evening sandals, shoes in India are fun and frivolous … and very tempting. 3. Buying jewelry in India is a blast. 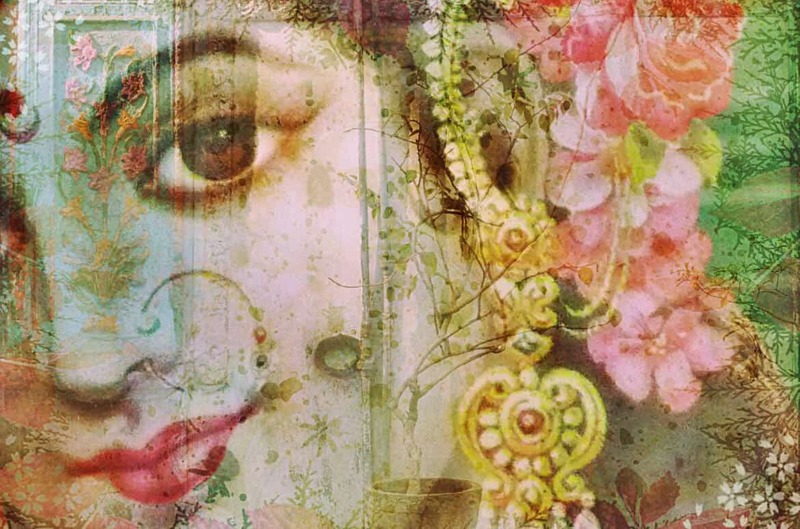 Indian women love jewelry, and the bigger and more ornate the better. There is an astounding variety of real and costume jewelry — to go with your princess look. 4. Tea. The champagne of tea, Darjeeling, comes from the hills of North-east India; and Assam and Nilgiri teas are excellent too. 5. Pashmina and other shawls. Real pashmina is a type of cashmere wool that comes from pashmina goats in the Himalayas. It is very costly. So, if someone offers you a pashmina for a small sum, such as $10, it’s probably a blend (at best). However, there are many beautiful shawls made in India from wool, silk, cotton and blends of these materials. 6. Scented products. India is, of course, the land of incense. And attar, a type of natural perfume extracted from flowers, herbs, spices, or barks, has been in use in India since ancient times. 7. Arts and crafts. Throughout India, traditional artisans make lovely rugs, furniture, pottery, clothing, textiles, boxes, home decor items — usually with unique regional variations which you will discover as you travel around the country. 8. Skin care products. Ayurvedic products, such as skin care and herbal remedies. Several commercial brands, such as Biotique, Himalaya and Shahnaz Herbal, are readily available. 9. Books. India publishes a LOT of books in English, at very affordable prices, and browsing the classic bookshops of Connaught Place in Delhi, or the bookstalls of Mumbai and Kolkata, is a favourite “time pass.” But if you can’t get to India, and want to read about India, check out my list of 10 books about India that are better than Shantaram for recommendations and links to Amazon if you want to buy any of them. The book you should start with is the classic Freedom at Midnight, all about the struggle for independence, Gandhi, partition and the birth of a nation. 10. Music and movies. Classical Indian and devotional music CDs, and Bollywood DVDs, are a great buy and make for a long-lasting souvenir. Bollywood is of course the world’s biggest movie-maker and many of the films they make in Mumbai (formerly Bombay) are of top-notch quality and appealing to viewers around the globe. I highly recommend the mega-hit Jodhaa Akbar, for example (below, which you can buy on Amazon). For more info, read Bollywood Primer: Top 4 things you need to know.